Dine with the girls in this zesty cafe at The Fort, stocked with delectable local dishes and gourmet meals-to-share at reasonable prices. A lot of domesticated Cosmo chicks are probably familiar with Gourdo's for their kitchenware and specialty food treats. But, we recommend you also try their cafe at The Fort, which traces its beginnings back to an old and abandoned Italian restaurant. Before heading out on a gimmick, load up on some comfort food at Gourdo's Cafe, a fun, quirky, colorful pit-stop for the whole barkada (or, for you and your man). With traveler’s maps and cozy brick walls completing the warm ambiance, Gourdo's is a warm and relaxed chowtime venue with the best picks from around the globe. A decade and eight stores later, Gourdo's menu continues to evolve. With new executive chef, Tristan Encarnacion, the menu has taken another turn, with innovations such as the Peach, Bacon, and Cheese Pizza; Filipino Pizza; and a new Pistahan Menu added to the line-up. You and the girls can start out with appetizers like Buffalo Wings with Blue Cheese Dressing (P250) or Beer Battered Chicken Fingers (P255). Cosmo recommends their Coconut Prawns (P335)—coconut breaded prawns served with sweet-spicy sauce. The detectable taste of coconut creates a unique flavor with this fresh take on the regular prawn. You can then proceed to hearty soups and classic salads before moving on to the wide selection of main courses. For those who wish to remain in the realm of the familiar, there are the staple sandwiches as well as cream and tomato-based, meat and seafood pastas (ranging from about P250 to P350 per plate). But if you’re looking for that perfectly cozy, easy to devour comfort food to satisfy the whole gang, when has good ol’ pizza ever let you down? Gourdo's pizzas are cooked in a wood-burning oven that adds special character to the flavor. Cosmo recommends you take advantage of this sulit deal: Get three different kinds of pizza for only P499. You can choose from Margherita,Vegetarian, Hawaiian, and Neapolitan, to accommodate everyone’s preferences. For something different, you might want to try their Filipino Pizza (P300), topped with Gourdo’s Longganisa, Farmer’s Cheese, Green Mango, and Adobo Sauce, plus itlog na maalat. If you're craving something closer to home, the recently introduced Pistahan Menu features Filipino dishes that are familiar yet creative. For a classic dish, try Tinolang Sinigang na Manok (P390)—its soup is thickened with gabi, combined with luya and sampaloc; or one of their best-sellers, Kare-kare (P510). You might want to go for their Crispy Binagoongan (305), best paired with Ensaladang Mangga, Talong at Bagoong (P65). Or for something deliciously savory, try the Baby Back Adobo (P355), a unique blend of adobo and barbecue ribs. It is often easiest to indulge when surrounded by friends! So, complete the barkada food trip by treating yourself to some sweet goodness. Gourdo's gelato display is very tempting, with flavors such as Pistachio, Nutella, Dulce de Leche, Cherry Marble Swirls, and Tiramisu (P70 per scoop). If you're looking for a yummy yet guilt-free option, we suggest their Sugar-free Chocolate gelato (P85 per scoop), a must-try for dark chocolate lovers. It is also difficult to resist the cakes supplied by award-winning chefs Jackie Ang-Po and Buddy Trinidad. But not to worry, there are also sugar-free cakes to try, like the Sugar-free Chocolate Flourless Cake (P135). Once you’ve eaten to your hearts' content, Gourdo's Cafe will surely become a regular destination for satisfying your group's cravings time and time again. 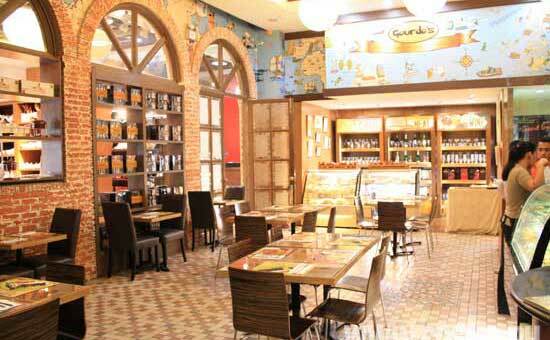 Gourdo’s Cafe is located at The Fort Entertainment Center, Bonifacio Global City, Taguig. For inquiries and reservations, call 845-1700 or 887-5007. For delivery, orders may be placed via City Delivery by dialing 87878.